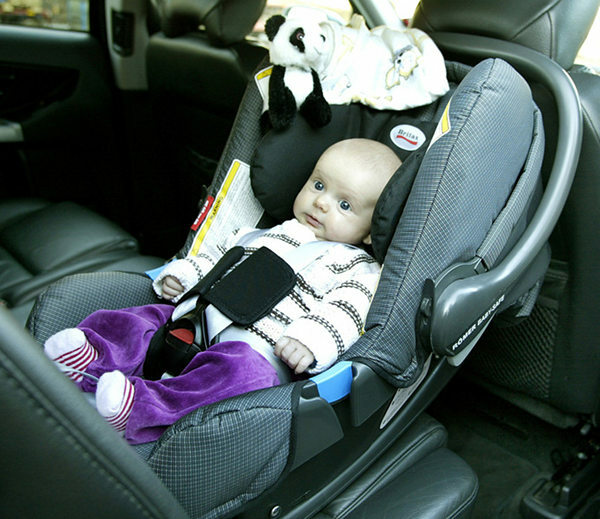 What the statistics say about car seat safety in Australia… join the discussion! It’s a topic I have been hot on the trail of since my first son was a newborn – the issue of child car seat safety. With so much information and misinformation flying around, how on earth are parents supposed to make sense of it all in order to make the safest choices in car safety for their children? We recently attended a special event held by Volvo and spoke at length with leading worldwide safety expert Lotta Jakobsson. She heads the International Organisation for Standardisation working group on child restraint systems (in road vehicles) and, with seventeen years’ expertise, is calling for an overhaul of Australia’s child car seat laws. Fitting car seats using the existing seat belt and top tether strap often proves too complex for parents. Ms Jakobsson recently visited Australia to present the latest research from the Safety Centre at Volvo, which advocates rigid base Isofix seats to prevent incorrect installation. ISOFIX uses a failproof method of installing car seats via metal loops welded to the car body – the car seat simply clicks into place. Ms Jakobssen says that with current Australian systems, parents usually install the top tether correctly but the rest of the installation is often wrong. Research also indicates that a child in a rear-facing seat is ninety per cent less likely to be hurt in an accident. 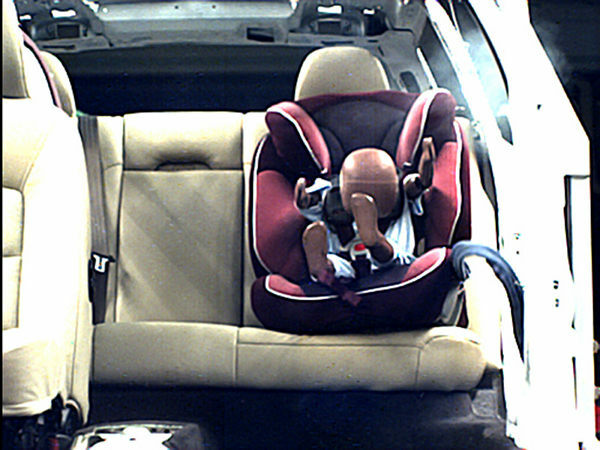 The much-touted AHR (Active Head Restraint – side impact) technology isn’t going to do much to protect your child’s head and neck in a frontal collision, as you can see in the photo below. – According to a 2010 government report in Australia, as many as eighty children a year are killed in car accidents and another four thousand are injured. – Studies show that up to the age of four, children’s heads are bigger in proportion to the rest of their body and in the unfortunate event of an accident (if they are forward facing), their head can snap forward – thus causing their neck to snap, with severity depending on the speed. – Rear facing seats have been compulsory in Sweden since 1964, with only five child fatalities in the forty-six years since this rule came into effect. – Australian standard rear facing seats only accommodate children up to 18kg. – The World Health Organisation estimates about 1.3 million people die each year in road traffic crashes around the world, with fatalities tipped to reach 2.4 million a year by 2030 unless measures to curb them are put in place. – Volvo research experts, after studying forty thousand crashes, suggest that all children aged up to four should be in rear facing seats. – Realising the need for a standardised system for car seats, the International Standards Organization with the support of fifteen nations, created the ISOFIX anchorage system in 1999, subsequently adopted as a standard in the US, Canada and Europe. – International Standards Organisation Fixation child seats, which allow children up to four years old to face the rear of a vehicle, are not available in Australia. What do you think about the existing car seat laws in Australia and access to the safest seats? Rear-facing until four was a topic of discussion on our Facebook page not long ago, with opinions varying greatly. We’d love your feedback and you can help herald change by contributing to the discussion!